Southco Asia Ltd., a subsidiary of Southco Inc., a leading global provider of engineered access solutions such as locks, latches, captive fasteners, electronic access solutions and hinges/ positioning technology, announces an expansion of AV Display Mounts offering with two new versions that allow the height of a monitor or display to be precisely adjusted according to end user preferences. The unveiled AV Display Mounts, AV-D32 Series, includes a vertically articulating tilt, swivel and swing mount (V Series) and dual extension mount (W Series) designed with Southco integrated positioning technology for precise control and customization of operation. This innovative design enhances the ergonomics and flexibility provided to operators in use of medical LCD mounting workstation, heavy panels and medical equipment. The V Series offers with a single vertical articulating arm that provides tilt, swivel and swing positioning and is available in wall mounted or table mounted configurations. The W Series delivers the same functionality and adds an extended range of motion with the addition of a fixed, angled lower arm. Additionally, the W Series can be horizontally mounted to a table top or mobile cart application and is available with an optional locking mechanism to secure the height adjusting arm in a safe operation. 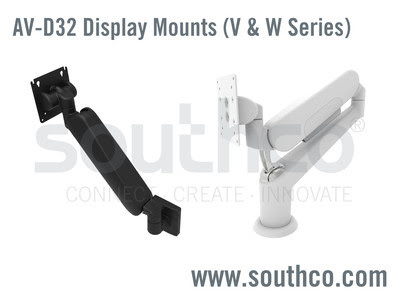 With the addition of the height adjustable feature, the AV-D32 Series Display Mounts offer the same validated cycle life and ease of operation as Southco's line of Display Mounting solutions. The AV-D32 Series provide up to 275mm of vertical travel and integrated wire management channels with minimal joints for easy maintenance and cleaning. The new series features a streamlined industry design with easy customization and engineered in accordance with VESA compliance which support a wide range of displays weighing up to 12kg. Global Product Manager Todd Schwanger adds, "The vertically articulating design of the AV-D32 Series allows a display or monitor to be adjusted to end user height preferences, while holding displays securely in place during touchscreen operation, under vibration or when devices are mounted to uneven surfaces." Southco's complete line of Display Mounting solutions eliminates the need for constant maintenance and readjustment, enables effortless fingertip positioning and boasts a tested, repeatable cycle life validated for 20k cycles of operation. Integrated positioning technology and controlled motion ensure safe operation of heavy, delicate or hazardous equipment without effort in challenging environments.